Income-seeking investors interested in oil and gas royalty trusts should focus on names that are in the early stages of their life spans and have the potential to grow their distributions in the near term. Exploration and production outfit SandRidge Energy (NYSE: SD) formed SandRidge Permian Basin Trust (NYSE: PER) in 2011. The trust and its sponsor share royalties based on oil and gas production from an area of mutual interest (AMI) that encompasses 15,900 net acres in Andrews County, Texas, an area of the Permian Basin that primarily produces crude oil. Crude oil accounted for more than 90 percent of production in the AMI in 2011, while the reserves consist of 87 percent oil, 9 percent natural gas liquids (NGL) and 4 percent natural gas. With US natural-gas prices still depressed and the price of WTI over $80 per barrel, the trust’s oil-heavy production mix is a considerable advantage. When SandRidge Energy created the trust on May 12, 2011, the AMI included 517 producing wells; the trust is entitled to receive 80 percent of the net proceeds from these wells until termination. Net proceeds are defined as the value of oil and gas sold minus post-production expenses such as production-related taxes and costs associated with gathering and transporting the hydrocarbons. For the year ended December 2011, total taxes and post-production costs amounted to $4.19 per barrel of oil equivalent produced. In addition, SandRidge Energy agreed to drill 888 wells in the AMI. These developmental wells must conform to certain minimum standards in terms of length and depth, with the parent bearing 100 percent of the drilling costs. The trust is entitled to 70 percent of the net proceeds from sales oil and gas lifted from these developmental wells. When the trust launched, SandRidge Energy estimated that this drilling program would be completed by March 31, 2015, though the sponsor has until March 31, 2016, to sink the required wells. The structure of the trust includes two provisions that will insulate the trust’s cash flow from fluctuations in oil prices, at least in the near term. From the beginning of 2012 through the end of March 2015, hedges contributed by SandRidge Energy will cover about 78 percent of the trust’s projected cash flow. For example, management estimates that a 15 percent decline in the price of WTI crude oil relative to its estimates wouldn’t affect the trust’s ability to pay its forecast quarterly distribution. The trust’s subordinated-unit structure also reduces risks associated with volatile commodity prices. SandRidge Energy holds 13.125 subordinated units–about one-quarter of the overall float–that entitle it to a normal quarterly distribution. However, if the trust’s quarterly disbursement falls more than 20 percent short of a predetermined payout, some of the distributions accruing to the subordinate units will be reallocated to ensure that regular investors receive at least 80 percent of this target. Four quarters after SandRidge Energy fulfills its drilling obligations, the subordinated units convert to common units. As compensation, SandRidge Energy earns incentive distribution payments when the quarterly payout to unitholders exceeds the target by 20 percent. This bonus is a small price to pay for the peace of mind provided by the subordinated-unit structure. After the subordination period ends and the hedges expire, SandRidge Permian Basin Trust’s distributable cash flow will fluctuate with oil prices and the wells’ natural decline rates. When the trust terminates on March 31, 2031, the royalty interest will be sold and the proceeds divvied up among unitholders as a final distribution. This graph depicts the trust’s targeted distributions levels at the time of the trust’s IPO in 2011. Note that the initial distribution appears elevated because it covered one-and-a-half quarters of production. A third-party auditor expects the targeted distribution to climb in the first three to four years as SandRidge Energy drills and completes the 888 developmental wells. Soon after this drilling program ends and production starts to decline, the trust’s quarterly payout will gradually diminish until the termination date in 2031. The estimates call for the distribution to peak at more than $0.80 per unit in late 2014 and drop to less than $0.20 per quarter by 2031. Proceeds from the sale of the royalty interest, estimated at $1.63 per unit, aren’t included in this graph. SandRidge Permian Basin Trust has paid four distributions since going public in 2011; all of these disbursements exceeded the target established in the trust offering documents. These higher-than-expected distributions don’t reflect improved commodity prices; in fact, oil prices are significantly lower than SandRidge Permian Basin estimated in its initial S-1 registration statement. 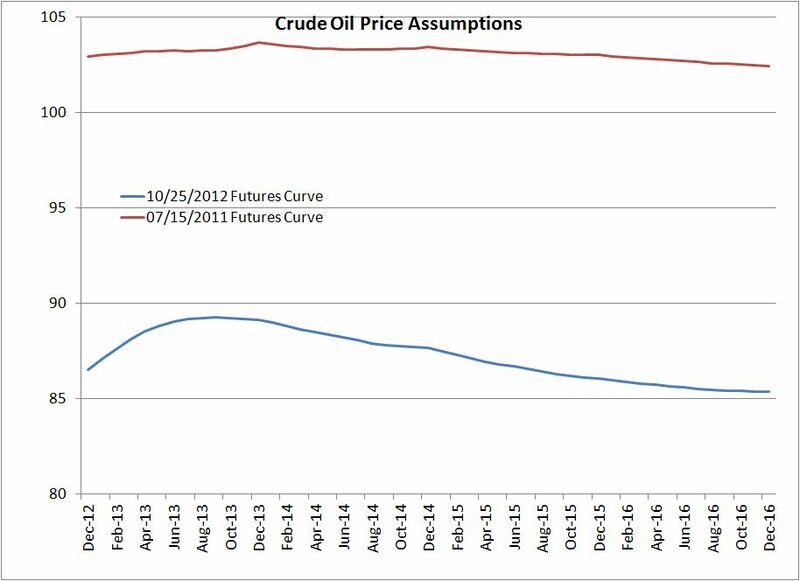 The oil-price assumptions that underlie the trust’s targeted distributions reflect futures prices from mid-July 2011, when the market indicated that WTI crude oil would fetch more than $100 per barrel in the third quarter of 2012. Even with the hedges in place, oil prices of $87 per barrel have weighed on SandRidge Permian Basin Trust’s cash flow. Assumptions about the timing of SandRidge Energy’s drilling program must also be adjusted. With only 541 of the 888 wells left to drill, the trust’s sponsor will fulfill this obligation by mid-2014 if development occurs at the same pace. This accelerated drilling program has also bolstered production beyond expected levels. In the second quarter of 2012, oil production exceeded forecast levels by 13 percent, while gas production was 14 percent ahead of plan. 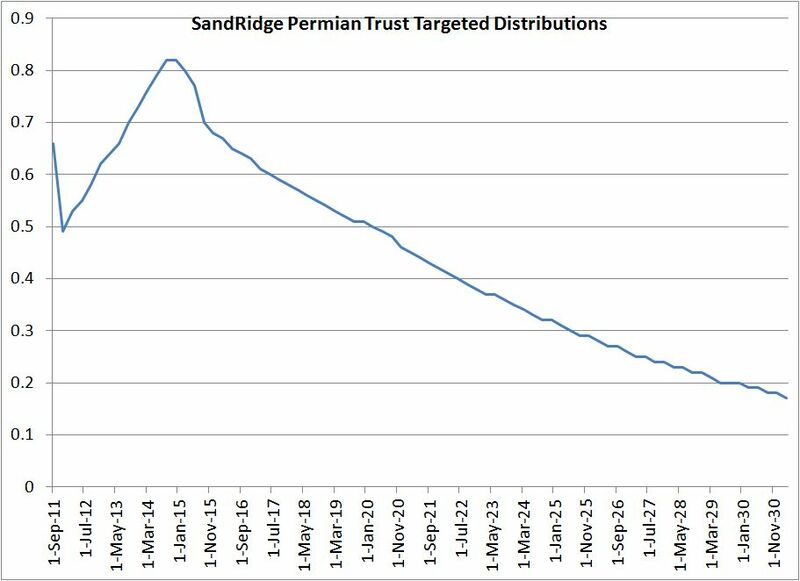 My base valuation scenario assumes that SandRidge Permian Basin Trust achieves its peak distributions in late 2013–a year earlier than expected–and that the distribution begins to decline in early 2014. Using a 7.5 percent discount rate, our NPV model yields a fair value of $20.50 per unit. 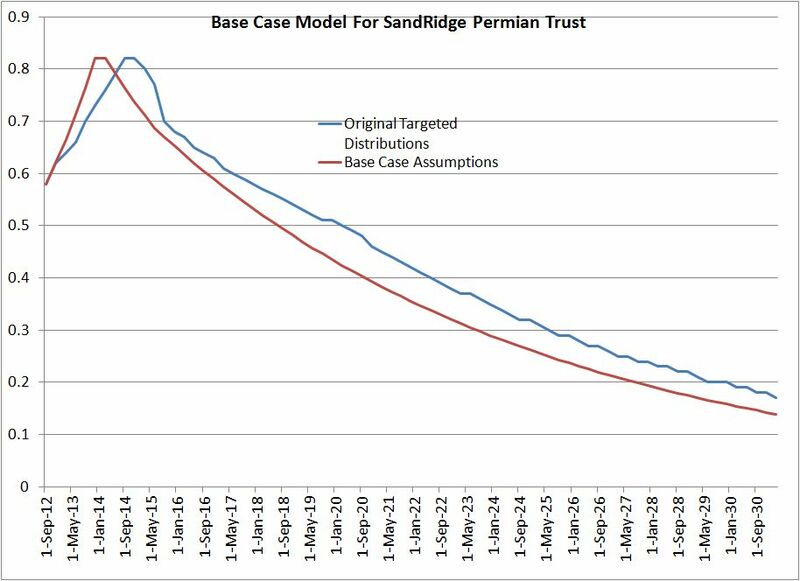 This graph compares the original targeted distributions published in SandRidge Permian Trust’s S-1 statement to the assumptions underpinning our valuation model. As you can see, our model calls for distributions to peak ahead of schedule and then follow a similar decline rate as production matures. Note that the net present value doesn’t necessarily constitute a price target. An investor who purchases a stake in SandRidge Permian Basin Trust at $20.50 per unit or less can expect to earn an average annual return of about 7.5 percent by holding the stock and collecting distributions–assuming that the scenario underpinning the model plays out. Our bullish case assumes that the trust meets its targeted quarterly distributions up until its termination in 2031. This set of assumptions generates an NPV of about $22 per unit. Assuming that the trust meets its targeted distributions up until 2014 and subsequent payouts fall 15 percent short of projections yields an NPV of $19.25 per unit. Our base-case estimates for the next four quarters suggest that the stock yields about 13.1 percent at the current quote. According to the trust’s S-1 statement, about 55 percent of the distributions you receive will be taxed as ordinary income, while the remaining 45 percent would be a tax-deferred return of capital. For our most up-to-date valuation of SandRidge Permian Basin Trust and our current price target, subscribe to Energy & Income Advisor. Want the absolute HIGHEST cash dividends you can depend on, including tax-free monthly and quarterly payouts? Get ALL of Elliott Gue’s TOP dividend-payers now. Use the Discount Code “profit” for 20% off a quarterly subscription. Sign up for your risk-free subscription today! In a world where anyone and everyone can broadcast his or her opinion and volume tends to drown out reason, individual investors have come to prize Elliott’s in-depth knowledge and rational assessment of the companies and the markets he covers. When fear-mongering pundits claimed that the Macondo oil spill marked the end of offshore drilling, Elliott Gue provided a welcome dose of reality, explaining to attendees of the 2010 San Francisco MoneyShow why the death of deepwater exploration and production was greatly exaggerated. Investors who heeded this contrarian call raked in impressive gains on shares of contract drillers and equipment providers. This and other prescient investment calls prompted the official program for the 2008 G-8 Summit in Tokyo to call Elliott Gue “the world’s leading energy strategist.” He has also appeared on CNBC and Bloomberg TV and has been quoted in a number of major publications, including Barron’s, Forbes and the Washington Post.